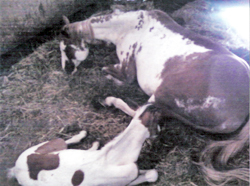 Once upon a time, there were three baby horses, born only one week apart from each other. One was born to a Black Tennessee Walker, one was born to a Mustang mama, and the last one was born to a loud brown and white Paint mama. 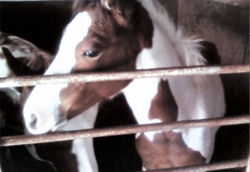 Ironically, all three babies had different black and white Paint Horse fathers. 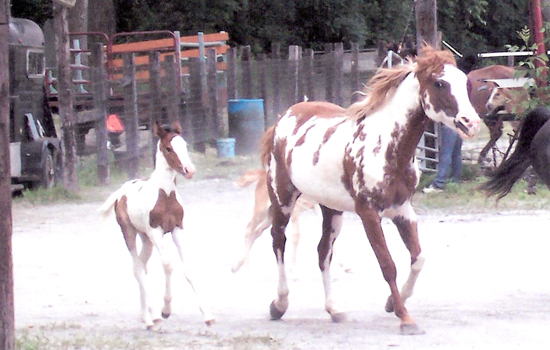 The Tennessee Walker and the Paint mama were bred by a black and white Paint father who was considered insane! 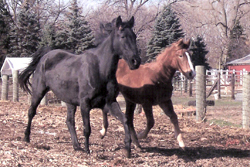 The Mustang mama was bred by a very talented black and white trick horse. Oh, by the way, none of these breedings were planned. Matter of fact, they were all a surprise until only one or two weeks before the babies arrived. Because they came on such short notice, we were scrambling for some place to house them. Of the three mamas, only two were owned by us. The third mama was owned by a border who took the surprise breeding in stride. 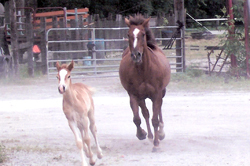 Because we practice Pat Parelli Natural Horsemanship, we were able to naturally develop a relationship with the babies. What was interesting was the better the relationship was with the mother, the better the relationship was with the baby. Mother Morning Star and Baby Sashe. The world outside the stall. 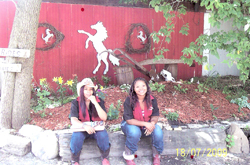 Morning Star and Baby Sashe. Cayenne and Baby Tango. Angel I (mother) and Angel II (baby).